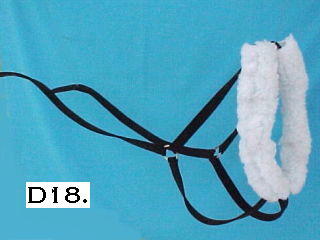 The harness collar is adjustable & covered in heavy saddle pad fleece. Straps attach with a large O ring between front legs and top of shoulders. These straps come out to the dog's sides and attach with another O ring to the traces. to attach to a single tree (just like a horse harness). SMALL Fits Dogs 50 to 69 lb. MEDIUM Fits Dogs 70 to 99 lb. LARGE Fits Dogs 100 to 160 lb. This set has the Pulling Harness plus a Gig Saddle to hold the cart shafts. 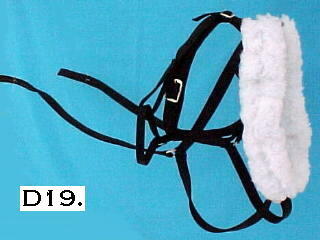 The Gig Saddle is made of 2" wide nylon to spread weight across dog's back. and double thick nylon shaft loops to hold up the cart. Columbia River Newfoundland Club has plans for a dog cart made of PVC pipe. Made of 1/8" thick Black PVC (thick, tuff, shiny vinyl). Covers cat's face so it can't see you or bite you. The nylon tie cord has ends that are mushroomed so they won't pull out. Brass eyelets make the muzzle durable and quick to adjust. 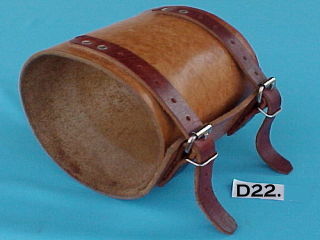 The muzzle is easy to sterilize or wash.
D21. 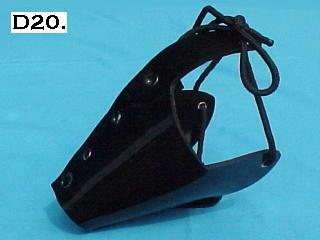 Slip On Leather Dog Muzzle. 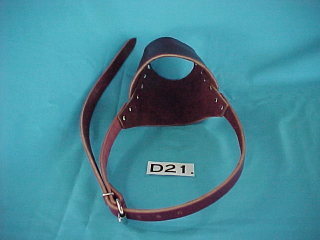 Made of burgundy latigo leather (soft and strong) with a steel roller buckle to fasten quickly. Extra long head strap makes it easy to put on vicious dogs. Great for veterinary work. D23. 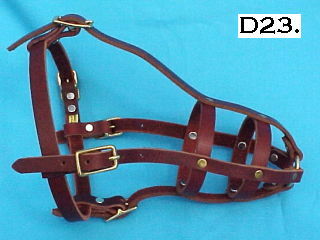 Old Style Leather Dog Muzzle. Made 1/2" wide burgundy latigo leather straps. Allows room for dogs to breathe. D22. Leather No Chew Dog Collar.